· 2 NSF fiberglass pressure rated reinforced vessels. · Pressure controlled operation from 0—125 psi. · A pre-filter assembly (50 micron) for the removal of sediment, sand and particulate matter. · A totalizing meter to monitor gallon usage. · Sample ports to monitor performance and allow sampling of influent, interim and effluent. · Adaptable to any type of plumbing configuration. The system has no bypass thereby preventing accidental use of contaminated water. The first vessel in the series is the gross removal unit and the second vessel acts as a polishing unit and safety buffer. The system design allows up to 10 gallons per minute of contact time on the filter media and is effective on large concentrations of dangerous organic chemicals. This is more than sufficient to support the needs of an average household. Testing has shown that the lead vessel is normally depleted at 100,000 gallons, or approximately one year from start up. At this time, the first vessel is removed for regeneration, the second “safety” vessel is placed in the first position, and a vessel of fresh carbon is placed as the secondary vessel. This ensures a safety buffer of 100,000 gallons of usage on the new vessel’s fresh carbon. If 100,000 gallons has not been used and break through has not occurred at year’s end, a one-tank filter change is still done to prevent any risk of bacterial growth. · Systems are installed by licensed plumbers in accordance with applicable plumbing codes. 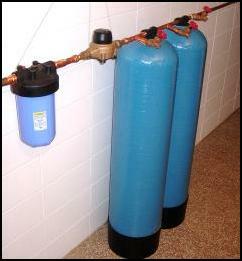 · Systems are generally installed at the well head prior to softeners and conditioning units. · Always installed upstream of all water taps or other consumer use connections in the residence. · Quick couplers allow easy change-out of vessels. · Additional vessels can be utilized for higher gpm. A Division of North American Aqua Environmental, LLC . . . . . .